The word 'pasha' is an honorary title in the military in Turkey and we would definitely rank this restaurant to one of the highest! Many other Tel Avivians will agree with us that Pasha is a great restaurant, hence why it's always packed. It's designed beautifully and divided into two parts, one part has 'normal' tables and chairs and the other part has more 'bar-like' seats. 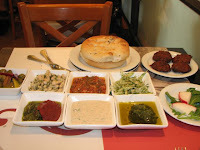 Thanks to the business menu that they have, you can enjoy the great Turkish dishes for an affordable price. The business menu includes different kinds of yummy appetizers, such tahina, falafel, salads etc, as you can see on the picture, and a main dish: Kebabs, Pargit (spring chicken), steaks, Kubeh and etc. But don't leave this restaurant without trying the spring chicken stuffed with pistachios and cashewnuts! That's a winning combination of a creamy flavor of the nuts that fits perfectly with the juicy spring chicken meat. We've also tried the "Masahne", which is tenderloin on a Pita, which was also very good. 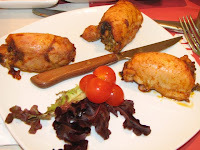 The meat is of good quality, very juicy and full of good flavors. 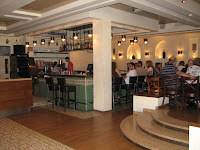 Ha'Arba'a is next to the Cinemateque, on Carlebach st. You can reach Carlebach by going to the beginning of Ibn Gvirol (go south), where it connects to Yehuda Halevi st.
* Detail: Pasha is a kosher restaurant.